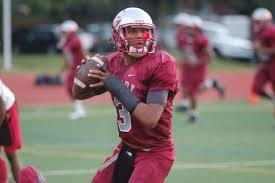 Caylin Newton, Grady, QB 5’11” 185 lbs. Newton had a near perfect game Friday September 16, 2016 in the Grey Knights region opener versus Lithia Springs. Caylin was 18 of 22 for 364 yards with 5 TDs. He also carried the ball twice for 53 yards. Despite playing only in the first half, Newton’s & the Grey Knights performance were enough to win him honors for the Touchdown Club of Atlanta’s Back of the Week. Caylin Newton joins with his brother Cam (Westlake, Back of the Week 2004) as just the fifth set of brothers to win Player of the Week awards from the Touchdown Club of Atlanta since 1938.